Today I would like to focus on communication with your partner at the time of the menopause. We know from our recent survey of over 1100 women that more than two thirds find it really difficult to broach the subject with their partner and it's something that obviously needs to be communicated due to the damage it can cause relationships if you don't get some help. So without further ado - Let's Talk About Menopause: Communicating With Your Partner. I also learned from a survey we conducted last year regarding men and their relationships with their partners during menopause, that the men often feel rejected, frustrated and bewildered about what’s happening to their significant other. But that isn’t surprising when in fact, the women really don’t understand themselves! That’s why it’s terribly important to make sure that you are ready to have your conversation about menopause and that you've also got a bit of knowledge about how to manage your symptoms, so that you are able to get through this time together. There is a lot of research out there that will help you get through this transition. We know from dealing with men as well, that if they are educated and informed they can learn how to best support their partner through menopause. In fact, I currently have a private men’s group on Facebook that does just that called Men-o-pause. Our survey results indicate that a large number of women fear that their partner would leave them for someone else due to the changes that occur during the menopause. In reality, the majority of men really do want to help. They also want to get back the girl they fell in love with which includes feeling loved and nurtured in the way they were before the menopause. And you must understand that at times they don't recognise the person they're living with any more than you know yourself. If you're feeling grouchy and snappy or you're so tired or you can't face being intimate, it's going to have a negative impact on your relationship. Very often our partners want to help but have no idea on what to do or where to begin. Before you can start that conversation, you need to get your head around what’s going on with you. What are your fears and anxieties? What’s your plan to get through menopause so that you reclaim your wellbeing? What do you think is going to be the outcome of the conversation? You need to have a list of suggestions of what you want your partner to do? Organise a time, maybe make like a date night and have your mind around what you're going to communicate. Be willing to be vulnerable and tell your partner that you've been afraid to have this talk in the past. Now that you know there is a solution, you feel a little bit better about talking about it. Remember to emphasise that you want to go through this journey together and I'm sure you'll find you do get support. You might want to do a bit of forward planning about how your partner can help you. For example, with your diet, if he goes shopping and brings in the things you're not supposed to be eating or drinking, like caffeine or lots of chocolate, gently remind him that these types of foods or beverages will make you feel worse and prevent you from alleviating your symptoms. The same with alcohol or products with gluten which can leave you feeling bloated. Once you know what your diet should be according to your symptom set, you can get him on side to help for the next few months. One of the best aspects of the natural menopause approach is that many of the changes especially, dietary adjustments are temporary and not a life sentence. That's really important when it comes to treatment options, you might want to then consider them together. List the things you are considering when choosing the natural menopause approach. Where's the best place to get help? On my website, you can learn the different aspects of my programme that can help you learn how to alleviate your symptoms and feel better than you have in the past. First you may want to see where you are in terms of your menopausal stage. Are you early menopause, perimenopause, menopause or postmenopause? Sometimes just knowing what stage you are in can shed some light on why you are feeling the way you do. We also have a section of the most common menopause symptoms women experience. Under each symptom we include a basic definition and the cause of the symptom, plus a case study. Below is a list of the symptoms we currently have addressed, with more to come in the future. If you would like to stay informed on topics relating to menopause, check out my Menopause Weekly Wisdoms. While there, sign up for my Hot Flash newsletter which provides the latest information, science and technology being used to help alleviate your menopause symptoms. In addition, I offer a managed self-help programme, the 14 Day Menopause Empowerment Programme and my highly successful guided instruction programme, the 6 Week Cruising Through The Menopause Boot Camp. You can attend my free virtual classes to learn about what’s happening in your body which includes tips and advice on how to overcome the most common symptoms. Bottom line, there are a variety of things that you can do and your husband or partner can be involved with that as well. treat yourselves to a dinner out or an intimate dinner at home. Allow yourselves the pleasure of a cuddle or massage on a regular basis, be attentive to each other’s needs and set time aside to really be with each other. Remember this is a journey you can do together because you’ll come out stronger for it at the end of the day. In this week’s Hot Flash newsletter, I am focusing on night sweats. I have three supplements that do a very good job of reducing this rather annoying symptom. A great first aid measure for a instant cool down during a flush. Become has created a range of tops, pants and leggings that absorb moisture. You can use them as short-term aid while you’re getting your symptoms under control. Again if you would like this information sent directly into your inbox, sign up for our Hot Flash Newsletter below. 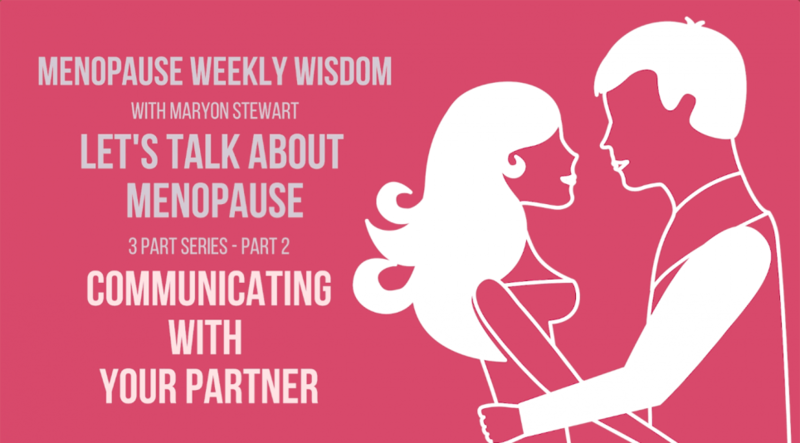 Watch Maryon's video discussing how to talk to your partner about menopause.